Back in February Electronic Arts released the latest title in the Real Racing franchise with the game quickly becoming the most successful version yet. 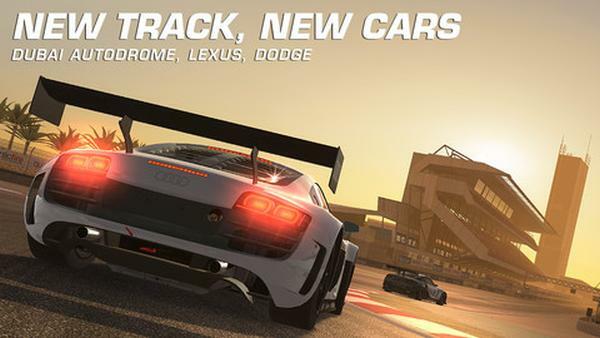 Today we have news that a new Real Racing 3 update brings lots more content to the already feature packed game. This latest update brings a brand new Dubai Autodrome track for users to enjoy that features six different layouts and users can burn rubber around it either during the day or at night. The developer has also added four brand new cars for your enjoyment that includes the likes of the Dodge Charger SRT8, Dodge Charger RT, Lexus LFA, and Lexus IS-F. The rather large update also brings to the table over fifty new events of racing to keep users occupied for lots more hours, and the great thing about Real Racing 3 is the fact it won’t cost you a dime to play. OK there will be times you may have to use a different car while another one is repaired in the garage unless you make an in-app purchase of more cash or crash helmets, but some users have been complaining the game hasn’t been functioning properly since the latest update. After downloading the update on both my Galaxy S3 and Nexus 7 and leaving my son to play it for a while he hasn’t reported any issues so far. If you have yet to give Real Racing 3 a try it can be downloaded from the App Store or Google Play.